This entry was posted in International Crime, International Happenings and tagged aviation, Flight MH370, Malaysia Airlines, mystery, security, world. Bookmark the permalink. Technically it is possible that the plane could have traveled along the east of the country (although lack of air defences does not dictate a lack of radar). I suspect that even if it tried this, it’s approach would have been picked up by the UAE, US naval ships stationed near Dubai, or Pakistan. Not saying it’s impossible, but it seems unlikely. It’s entirely possible that the plane suffered a systems failure (hence the transponder was disabled and communications ceased) caused by fire or something else and the pilots became disorientated – and tried to find their way home by following another plane (as has been reported). Eventually due to crippled avionics, lack of communication and having run out of fuel, the plane crashed into or landed on the Indian ocean. 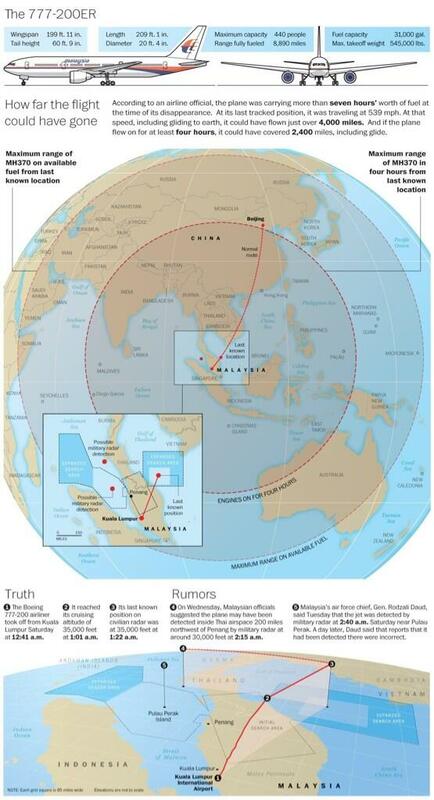 The problem with this explanation is that it seems they flew over Malaysia, and if so, why did they keep going into the abyss? Hi admin of this blog, do you allow guest posting ?? ?